While The Twilight Saga wraps up later this year, Stephenie Meyer fans and those with an interest in sci-fi have The Host to look forward to. We’ve officially passed the one-year mark in counting down to the adaptation’s March 29 release in 2013. We’ve already gotten a few glimpses of the film, including a handful of photos and a teaser. This latest photo gives us another peek at the lead character, and a great look at her eyes. ?Those familiar with Meyer’s story know that it’s set on earth following an alien invasion. Aliens called “souls” have not only taken over the planet, but also most of its human inhabitants, having inserted themselves into people’s bodies and infiltrated their minds. 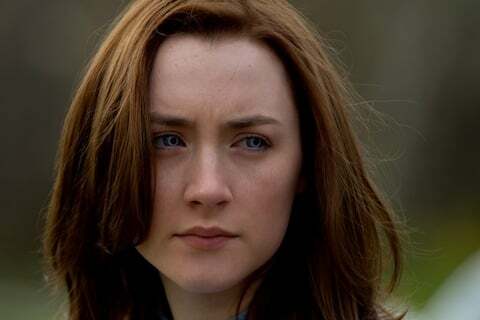 The story follows Melanie Stryder, who’s played by Saoirse Ronan, a young woman who’s inhabited by a soul called Wanderer. The emphasis on the eyes is played up on the cover of Meyer’s novel, and it’s also the primary focus of the recently released teaser-trailer, which ends with a zoom-in on Ronan as Melanie. In the story, the slightly glowing ring around the pupils indicates that a person has been inhabited by a soul. We can sort of see the ring in one of the previously released photos, but it’s much clearer in the above picture. On a related note, I was already a fan of Ronan from her performance in The Lovely Bones, but having finally caught Hanna on HBO, I’m now even more convinced she’s going to be great as Melanie/Wanderer in The Host. More information, photos and the teaser can be found in our Blend Film Database.